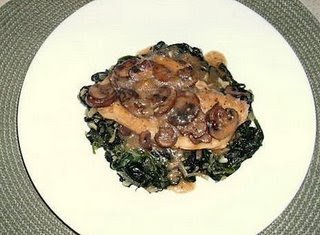 First up is Gloria of Cook Book Cuisine who has shared one of her best dinners: Sautéed chicken and baby bella mushrooms served over garlic spinach. Originally from the I'm Running To Eat blog who in turn got it from Dinners From A Year And Beyond. She guarantees you'll like it too - let her know how it turns out. 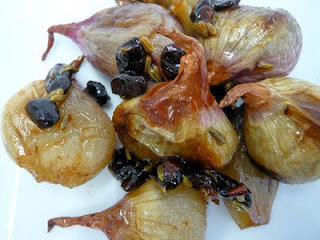 Christine from Kit's Chow has made these delicious sweet and sour shallots with raisins, fennel seeds & chilli from the Tesco foodie magazine. This recipe was found whilst searching for recipes with fennel seeds, after inspriation from Ivy's choice of spices for think spice. Ideal for roasts or cold meats, or a traditional ploughman's. Two's company, but three's even better when it comes to mac n' cheese for Chris at Mele Cotte who gives us her three cheese bake with three different cheeses. What better thing to do on a cold and rainy day than leaf through the Southern Living magazine where this version of the all time favourite came from. Chris is hosting Bookmarked Recipes next week - details of how to submit your recipes can be seen below. Next up is the first of two chicken recipes. This one from Jin Hooi Morris at Smell And Taste Are My Memory is for sesame chicken, which was the first thing to cook after a week of having to stay out of the kitchen due to extreme hot weather down under (this, posted on the day the UK ground to a halt in the snow!). From an original post from Kitchen Snippets, this dish is easy to put together, and certain to please. Our other chicken recipe comes from Arika at My Yummy life who has made Asian glazed chicken wings. These wings of fire, originally from Foodie With Family blog, made the ideal superbowl snack. Bet they would be good on the BBQ in the summer too. After two chicken recipes it must be time for something sweet, how about muffins? Holler from Tinned Tomatoes has been making magic muffins - buttermilk, beetroot and apple muffins to be precise. Originally from The Great Big Veg Challenge blog it seems like a great new way to use beetroot, when you're not adding them to chocolate cakes of course. Thanks too for bringing the veg challenge blog to our attention - there's so much good stuff to try there! Happy Cook at My Kitchen Tresures gives us our other muffin recipe. List your top three muffin flavours, and then put them all into one muffin, and you have Mocha, walnut choco chip muffins. If you're not craving them by the time you've read 'Moacha' and 'walnut' you're not human. Happy cook baked these after seeing the recipe on Passionate For Baking, and her daughter's friend can't wait to be invited round the next time they are cooked - what better praise can there be? Finally, my own contribution this week is a recipe for hazelnut shortbread. My grandmother's friend had a secret ingredient, which I think makes the best shortbread, and, although we lost her original in a couple of moves, I found this one in my old college text book - Practical Cookery by Ceserani, Kinton & Foskett, now bookmarked for next time. Showed here with coffee crème brûlée. I was just over at Julie's blog and happened to notice your comment about about the chocolate fondue and knew that you would know something about food. How would you like to do a guest post on my blog giving some delectable recipe for Valentines Day - something with chcocolate woud be good. You have a great blog. I used to live in the UK and my ex was a chef. Hey, do I get a finder's fee? hehe..I crack myself up.